New line - Sitting Pretty Kitty Necklace. An 18ct Gold plated over Sterling Silver silhouette cat with 12 crystals inlaid into the tail. Including a gold plated 18 inch Curb chain which fastens with a lobster clasp. The Cat is approximately 2.5cm tall and 1.5cm wide the whole drop (including the bail) is around 3cm. A highly polished, quality necklace which really catches the light. 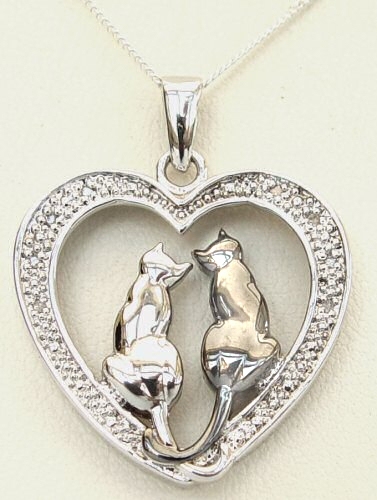 I Love Cats Necklace: a Sterling Silver (or Gold Plated) outline cat pendant with a heart body, curly tail and wearing a bow tie containing two small diamonds. 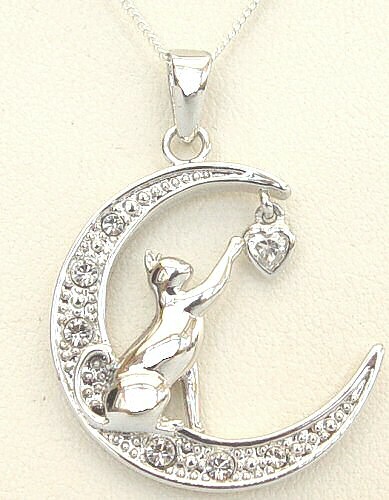 You Touch My Heart Necklace: Sterling Silver cat sitting in a crescent moon reaching up and touching a crystal heart. 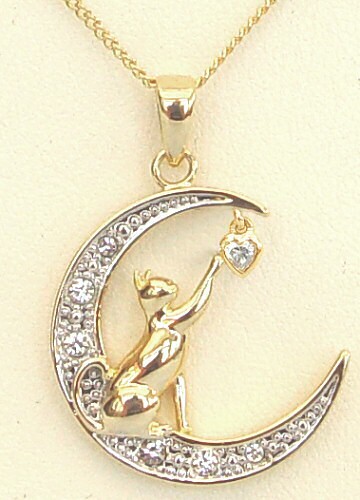 You Touch My Heart Necklace: 18 carat Gold plated cat sitting in a crescent moon reaching up and touching a crystal heart. Sitting Pretty Kitty: a sterling silver silhouette cat necklace with a silver heart dropper and crystals in it's tail, on an 18 inch sterling silver curb chain. 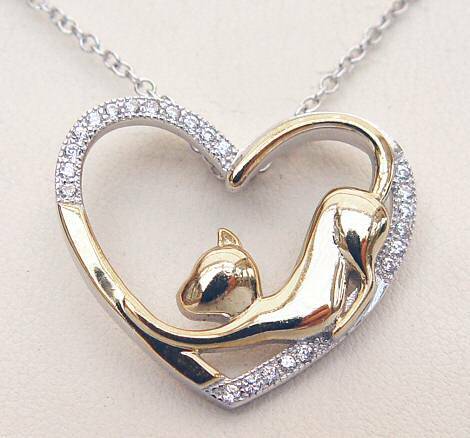 Always in my Heart... Cats: Sterling Silver Heart with Gold plated cat on a Sterling Silver Chain. 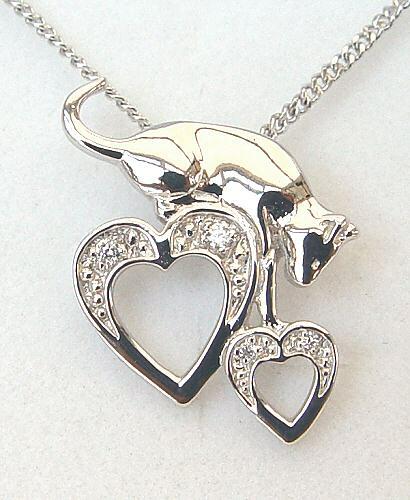 Sterling Silver and Diamond Cat Necklace featuring a cat climbing over a large heart to capture a smaller heart. 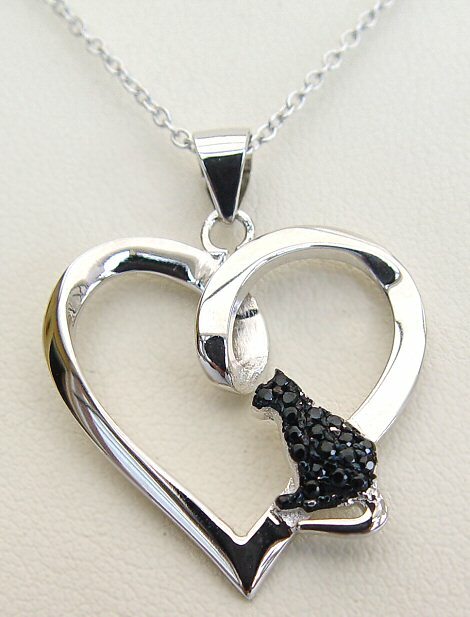 Love Black Cats Necklace: Sterling Silver heart necklace with a crystal covered black Cat. 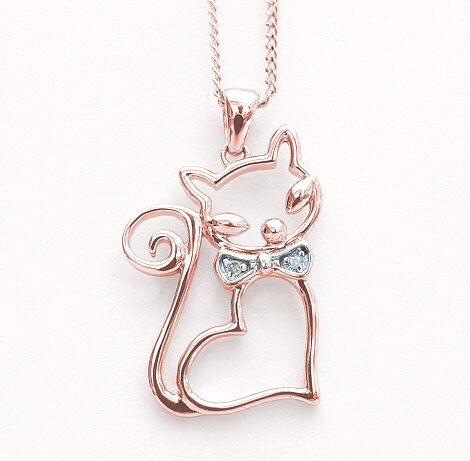 Short Description:- Sitting Pretty Kitty: a gold plated over sterling silver, silhouette cat necklace with crystals in it's tail, on an 18 inch gold plated curb chain.